There are a lot of similarities between the two teams who will meet at Jordan-Hare Stadium December 5th to battle it out for the 2018 AHSAA 7A state title. Both the Central-Phenix City Red Devils and Thompson Warriors have one state championship trophy apiece. Central brought their lone blue map back to Phenix City in 1993 after defeating the West End Lions 12-7 at Birmingham’s Legion Field. The Warriors last reigned supreme on the gridiron 36 years ago, taking the 1982 3A championship in legendary head coach Larry Simmons’ last season in Alabaster. 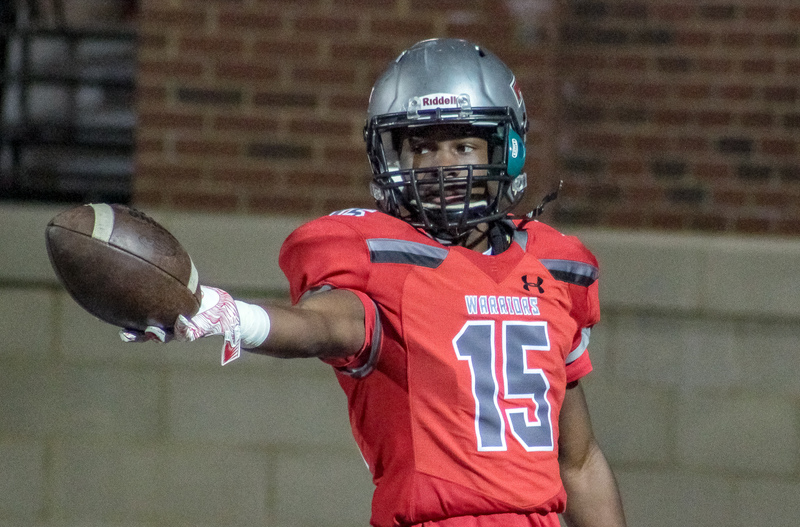 Thompson capped their only perfect season in program history beating the Oxford Yellow Jackets 14-11 on their home field – long before the AHSAA introduced the Super 7 format that we have today. Both squads are coming off a Super 7 near miss in 2017. The Red Devils were knocked out of a trip to Bryant-Denny last season in a heartbreaking 27-26 overtime loss at the hands of the McGill-Toolen Catholic Yellow Jackets in the semifinals. Thompson was bounced from the semis in a 31-12 defeat at the hands of eventual state champion Hoover, a team that the Warriors had beaten by a touchdown in the regular season. The similarities extend to the sidelines where both head coaches already have multiple state championships under their belt. Central’s Jamey Dubose captured a pair of titles in 2008 and 2011 during his tenure at the helm of the Prattville Lions. Over 13 years as a head coach the Opp native has a career record of 124-38. Since Dubose arrived in Phenix City the Devils have owned region 2, compiling a 29-1 record in region play and capturing five consecutive region titles in each of his seasons as head coach. On the opposite sideline, Thompson’s Mark Freeman brings two AHSAA crowns of his own into the title game. The Bessemer native’s back-to-back 5A crowns in 2012 and 2013 were won during his stint at the helm of the Spanish Fort Toros. There are also four AISA state championship trophies sitting at Freeman’s alma mater, Bessemer Academy, that were won during his 10 year stint as the Rebels head coach. Freeman’s record currently stands at 197-49 over 20 years as a head coach. Both squads have spent all of 2018 inside the Alabama Sports Writers Association top three since the beginning of the season. Central began the season ranked No. 3, the Devils climbed to the top spot in week four and have held it ever since. Thompson kicked off 2018 at the No. 2 spot, after slipping to third for five weeks, the sports writers returned the Warriors back to second in week 8. In our opinion this year’s 7A title game should go down as one for the ages, from passionate programs hungry for a title to prolific coaching to top flight talent, this No. 1 vs No. 2 matchup will definitely be worth the price of admission. Check out the offensive and defensive totals and players to watch . . . and go ahead and purchase your tickets online you don’t want to miss this one!